November 19, 2010 - Search and rescue crews have found the apparent wreckage of an Air Force F-22 Raptor. 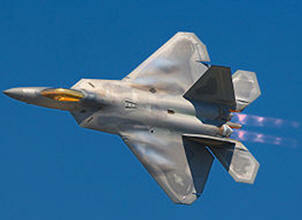 The F-22 lost contact with air traffic control at 7:40 p.m. local time while on a routine training mission on Tuesday. A search was coordinated by officials with the Alaska Air National Guard Rescue Coordination Center. Airmen in HH-60 Pave Hawk helicopters and an HC-130 King combed an area northeast of Cantwell, Alaska, the last known location of the aircraft. "Our thoughts and prayers are with the family of this missing Airman, and we thank all Alaskans for their continued support and prayers during this trying time," said Col. Jack McMullen, 3rd Wing commander. "Finding the missing pilot is our top priority." To continue searching for the missing pilot, a rescue team is being dispatched to the area, approximately 100 miles north of Anchorage, by the Alaska Air National Guard Rescue Coordination Center, the 3rd Wing and Joint Base Elmendorf-Richardson. "Last night a two-ship (flight) of F-22s, Rocky One and Rocky Three, were finished with training ... about 100 miles north of here," Colonel McMullen said. Everything was normal until about 7:40 p.m., he said, when Rocky Three fell off the radar scope and the pilot lost communications. "The other pilot (Rocky One) went to a tanker, got gas and then continued to look for the mishap pilot," Colonel McMullen said. "He could not find him. At that time, the Alaska Air National Guard scrambled a C-130 and rescue helicopters. They searched the entire night." About 10:15 a.m., an Alaska Air National Guard helicopter found a site that fits the data and the description of where rescuers thought the mishap probably occurred, Colonel McMullen said. "They found the crash site," he said. "They were unable to land at the crash site and take a closer look. We scrambled another helicopter that should be in the area in the next few moments." The Lockheed Martin/Boeing F-22 Raptor is a single-seat, twin-engine fifth-generation fighter aircraft that uses stealth technology. It was designed primarily as an air superiority fighter, but has additional capabilities that include ground attack, electronic warfare, and signals intelligence roles. Lockheed Martin Aeronautics is the prime contractor and is responsible for the majority of the airframe, weapon systems and final assembly of the F-22. Program partner Boeing Defense, Space & Security provides the wings, aft fuselage, avionics integration, and all of the pilot and maintenance training systems. The aircraft was variously designated F-22 and F/A-22 during the years prior to formally entering USAF service in December 2005 as the F-22A. Despite a protracted and costly development period, the United States Air Force considers the F-22 a critical component for the future of US tactical air power, and claims that the aircraft is unmatched by any known or projected fighter. While Lockheed Martin claims that the Raptor's combination of stealth, speed, agility, precision and situational awareness, combined with air-to-air and air-to-ground combat capabilities, makes it the best overall fighter in the world today.